This petition has been created by Forest Peoples Programme U. and may not represent the views of the Avaaz community. 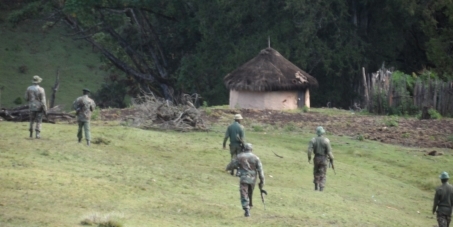 We are deeply concerned by the Government of Kenya’s forceful and illegal evictions of thousands of Sengwer indigenous people from their ancestral lands in Embobut Forest in the Cherangany Hills (Elgeyo Marakwet County, Kenya), which are happening right now. Forest guards have been burning Sengwer houses, and we estimate that as many as 1000 homes have now been burnt. "All school uniforms, cooking pans, water containers, cups were burnt. Now the children have to stay home while I find uniform and books. The children are very upset because we have lost everything. The children and elderly people will end up getting pneumonia because we don't have anything to cover ourselves at night"
For many years the Kenyan Government has been trying to move the indigenous Sengwer inhabitants of Embobut off their ancestral land by burning their homes and food stores. They have done this in the name of a fortress conservation approach which seeks to remove local people from their lands, and which makes the environmental situation worse while creating a human rights crisis. The UN Special Rapporteur on the rights of indigenous people, James Anaya, has urged the Government of Kenya “to ensure that the human rights of the Sengwer indigenous people are fully respected, in strict compliance with international standards protecting the rights of indigenous peoples. Any removal of Sengwer people from their traditional lands should not take place without adequate consultations and agreement with them, under just terms that are fully protective of their rights”, Mr. Anaya stressed. We appeal to the Government and Parliament of Kenya and to all responsible for guarding and securing the fundamental rights of such communities, to stop this forced eviction of the indigenous communities and other people at Embobut, which violates their human rights as protected by the constitution and international law. According to the 2010 Kenya Constitution (Article 63) and international law, the indigenous Sengwer have the right to not be moved from their ancestral territories unless they have given their free, prior and informed consent. These evictions are also in contempt of an interim injunction secured in the High Court in March 2013, and renewed on November 21st 2013, which makes the forced eviction of Sengwer homes a criminal offense.